Flintshire has become the latest Welsh county to adopt a flag, and campaigners hope the standard, adopted from an ancient design, will soon be flown across the area. It is the seventh historical area in Wales to register a flag with the Flag Institute, a charity which manages a list of banners, with two other counties - the former Cardiganshire and Radnorshire areas - still campaigning for their own. Dr Shaun Evans, who was one of the people behind Flintshire's new flag, said it won support from locals and the county council. "It is primarily about celebrating and promoting an identity for Flintshire and help sell the county to the world," said Dr Evans. 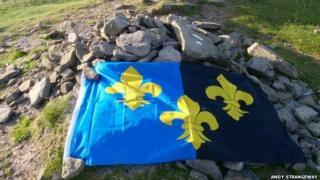 But has your county got a flag, and do you recognise it? This flag was launched in a flag dedication service in a local castle in 1988. The banner is based on the flag of St David, with the Tudor rose symbolising Henry VII, who was born in this county. The blue and green represent the land and cliffs of this region. This flag dates from the 12th century but was officially registered in 2013. It is based on a banner of the arms attributed to Iestyn ap Gwrgant, the last native ruler of the kindgom of Morgannwg, on which this county is based. The design has been used by various councils in the area. This flag dates from the 15th century. The design of three lions and a chevron is believed to date back to local ruler, Hwfa ap Cynddelw. The earliest reference made to it appears to be in the work of the 15th century bard Lewys Glyn Cothi. The arms were the recognisable county emblem before being registered as a flag, and were used by the local council, police and fire brigade. This flag, featuring three goats and a sun, was registered in January 2015 as a traditional design which dates back to the 17th century. It was an adaptation of the seal used by a former county council. The design was based on a description of a banner borne by the men of the area at the Battle of Agincourt, in the 17th century poem of the same name by Michael Drayton. This flag was registered in March 2012, but its origins date back to a 12th century king. The three eagles on this flag represent the legendary ones of a mountainous region in this area, whose Welsh name means "nest of eagles". The banner is originally understood to have been used by Owain Gwynedd, whose kingdom covered most of the present day county. The design has also featured on the seal and arms on the later county council and the emblems of a number of local organisations. The design of this flag dates back to the 14th century, when the choughs - the four black birds which feature on the standard - populated the coast of this county. Although choughs no longer live in this region they have been retained on the emblem, which has been used by councils and local clubs. The ancient arms is understood to be a banner posthumously assigned to Edwin Tegeingl, the 11th century Lord or King of Tegeingl, which formed the core of this county. This flag dates back to the 6th century and is based on the arms attributed by medieval heralds to King Inyr, who was from the county it represents. These arms have historically been part of the coat of arms of the local county council. They have also been used by local organisations including the rugby club. 1) Pembrokeshire; 2) Glamorgan; 3) Anglesey; 4) Merioneth; 5) Caernarfonshire; 6) Flintshire; 7) Monmouthshire. What would the union jack look like if the Scottish bit were removed?